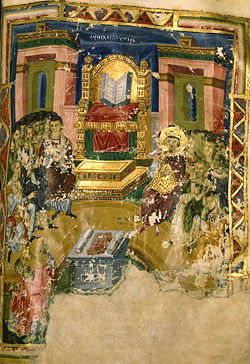 Early manuscript illustration of I Constantinople showing Theodosius I and Gregory of Nazianzus in positions of honor. The First Council of Constantinople (381), also known as the Second Ecumenical Council and I Constantinople was a gathering of 150 mostly Eastern bishops summoned by Emperor Theodosius I to confirm his earlier decree in support of the doctrine of the Council of Nicaea, which had fallen out of favor under the reigns of his predecessors. 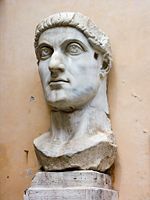 The council dealt a death blow to the formerly popular form of Christianity known as Arianism and basically settled the trinitarian controversy that had divided the empire since the time of Constantine the Great. Although the council represented the triumph of Nicene orthodoxy over Arianism with regard to the doctrine of the Trinity, it did not in fact create theological unity; and soon new issues surfaced, particularly over the question of Christology. I Constantinople is recognized as a legitimate ecumenical council by Assyrian Church of the East, the Oriental Orthodox, the Eastern Orthodox, the Roman Catholics, the Old Catholics, and a number of other Western Christian groups. However, the Catholics and other Western churches accepted only its doctrinal decrees and not as administrative rules, especially its recognition of Constantinople as the "New Rome." The council met in the church of Hagia Irene from May to July 381. It may have held a second session in the following year. The formal records of its proceedings have been lost, but its activities known from various letters and the writings of the church historians Socrates, Sozomen, and Theodoret. The Nicene Creed known to many Christians is in fact the creed adopted by I Constantinople, which clarified the original Nicene Creed and added new language regarding the nature of the Holy Spirit. 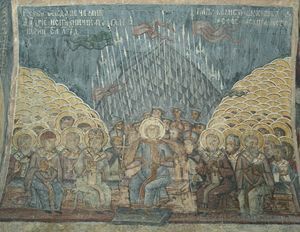 The Council of Nicaea, called by Emperor Constantine I to deal with the Arian controversy and clarify the definition of the Trinity, by no means settled the issue. By 327, it had become clear that the formula adopted at Nicaea had not created the unity which the emperor had hoped to achieve. The primary theological issue at stake dealt with the question of Christ's relation to God the Father before the Incarnation. Many bishops had refused to accept the Nicene term homoousios, usually translated as "same substance," to describe the relationship between the Son and the Father, a term which Constantine himself had endorsed. Moreover, anti-Arian churchmen such as the contentious and energetic Athanasius of Alexandria had used the theological issue to gain political advantage and intrude themselves into the theological affairs in distant lands, while Arian bishops had been cast out of their churches, much to the dismay of their parishioners. 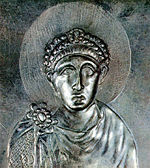 Under the influence of Eusebius of Nicomedia, the bishop of Constantinople, Constantine granted amnesty to the Arian leaders and exiled Athanasius. The former Alexandrian bishop, however, continued to be a vigorous defender of Nicene Christianity, gaining the support of Rome and several other key churches, and was later reinstalled. The vacillations of imperial politics resulted in nearly continual ecclesiastical tumult. 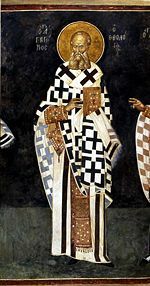 The greater number of the Eastern bishops were not Arians but agreed to the deposition of Athanasius, whom they viewed as inflexible, divisive, and unforgiving toward his adversaries. To accommodate a broader group under the umbrella of "orthodoxy," a council at Antioch in 341 omitted the contentious phrase "of one substance" from its creed, enabling a number of former Arians to endorse it in good conscience. Meanwhile a large number of new converts had been made among the Goths through the missionary work of the saintly Ulfilas, a disciple of Eusebius of Nicomedia who leaned heavily toward Arianism. 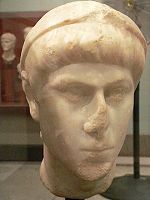 Emperor Constantius II now sought to unite Christendom by a less stringent creed. Athanasius was once again banished from Alexandria, and bishops who refused to denounce him found themselves persecuted. Even the bishop of Rome, Pope Liberius, was deposed by the emperor, and many of the churchmen and nobility at Rome accepted the antipope Felix II as his successor. Constantius II's formula stressed the "likeness" of the Father and the Son and banned both the Arian and Nicene terminology dealing with the question of "ousia" (substance/being). Opponents of this policy characterized it and similar non-Nicene formulas as "Semi-Arianism." Though now on the defensive, Nicaea still had courageous and eloquent supporters. The papacy, with the exception of Felix II, was relatively consistent in its support of the Nicene faith. The Cappadocian Fathers took up the torch on behalf of the Nicene formula in Asia Minor, while bishops such as Hilary of Poitiers did the same in the West. Up until about 360, theological debates mainly dealt with defining the Divinity of Jesus. However, because the Council of Nicaea had not clarified the issue of the Holy Spirit as the third person of the Trinity, this now became a major topic of debate. The Macedonians—also called the Pneumatomachians—emerged as a target of the Nicene faction because of doctrine of the Holy Spirit, which was seen as a Semi-Arian position, although Nicaea itself had not dealt with this issue. The controversy ebbed and flowed as new emperors came to power, and it would not be until Theodosius I ascended the imperial throne in 378 that the pro-Nicene party found a reliable imperial ally. On February 27, 380 Theodosius published an edict ordering that all of his subjects must profess the faith "of the bishops of Rome and Alexandria," namely the Nicene Creed. On November 26, Theodosius expelled Patriarch Demophilus of Constantinople after he refused to affirm the Creed and appointed the staunchly pro-Nicene Cappadocian Gregory of Nazianzus in his place. In May 381, he summoned a new major council at Constantinople to have the churches confirm what he had already decreed. The council gathered 150 Eastern bishops, only a few of whom were pro-Arian. Catholic sources indicate that Pope Damasus I also sent delegates, although it is not clear whether these were invited as voting participants. Presiding over the council in succession were Timothy of Alexandria, Meletius of Antioch, Gregory Nazianzus, and Nectarius of Constantinople. Reversing several previous councils that had supported various formula designed to accommodate semi-Arian beliefs, the council affirmed the original Nicene Creed as the true and accurate explanation of Scripture. However, it put forth its own new creed, which is sometimes known as the Nicene Creed of 381, and is often recited today as the "Nicene Creed." In addition to affirming what had been said earlier at Nicaea and condemning the various semi-Arian attitudes, the council also expanded the statement on the Holy Spirit to combat the "heresy" of the Pneumatomachi or Macedonians. This group had affirmed Nicaea's simple statement that "We believe in the Holy Ghost," but denied that the Holy Spirit constituted the eternally existing Third Person of the Trinity. The new creed defined the Holy Spirit as "the Lord, the Giver of Life, Who proceeds from the Father, With the Father and the Son he is worshiped and glorified." The statement regarding the Spirit's procession from the Father is particularly significant because it established that the Spirit, like the Son, must be of the same substance (ousia) as God the Father. The council's decision regarding the Holy Spirit thus gave official endorsement to the concept of the Trinity as it came to be understood in mainstream Christian tradition. However, the statement would later become a major bone of contention between the Catholic and Orthodox churches when Rome added the phrase "and the Son"—the filioque clause—to indicate that the Holy Spirit proceeds both from the Father and the Son. The council is also notable for its declaration of Constantinople as "New Rome," giving it a primacy of honor second only to the church of Roman itself. This and other non-doctrinal rules passed by the council were not universally accepted, even by important pro-Nicene bishops such as those of Rome, Antioch, and Alexandria. However, in negotiating the acceptance of the Council of Chalcedon in 451, Rome and its allies were forced to accept the ecumenicity of I Constantinople. The council dealt a major blow against Arianism, from which this movement never recovered. The first canon is a dogmatic condemnation of all shades of "Arianism," including the formulas endorsed by recent emperors which were designed to ban both classical Arian and Nicene language. It also condemned Macedonianism and Apollinarianism. The second canon renews the Nicene legislation imposing upon the bishops the observance of diocesan and patriarchal limits. 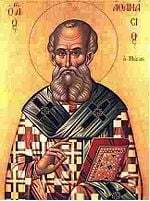 It specifically reigns in the bishop of Alexandria, who had become infamous in the time of Athanasius for intruding into the affairs of churches far and wide. The famous third canon affirmed Constantinople as the "New Rome," second in ecclesiastical honor only to Rome itself. This canon was a first step in the rising importance of the new imperial capital, just 50 years old, and was also notable in that it demoted the patriarchs of Antioch and Alexandria. By 451, in the Council of Chalcedon (Canon IX), Constantinople would be recognized as the ecumenical jurisdiction of highest ecclesiastical appeal, although the papacy has never accepted this. The fifth canon accepts the churchmen of Antioch who affirm the Trinity. It was passed in response to Tome of the Western bishops, perhaps that of Pope Damasus I, which is no longer extant. The sixth canon limits the ability to accuse bishops of wrongdoing, stipulating that those who bring such charges must be prepared to have their own characters and orthodox examined. The seventh canon regards procedures for receiving certain "heretics" into the church. Those guilty of Arianism, Novatianism, and some other heresies do not require new baptism, but Eunomians, Montanists, and Sabellians must be baptized again. The First Council of Constantinople succeeded where the Council of Nicaea had failed in sounding the death knell of Arianism. Its success, however, was not due so much to having achieved a true consensus among the brethren, for many Arian and Semi-Arian Christians remained unconvinced of the correctness of the "orthodox" version of the doctrine of the Trinity, and many others, though orthodox themselves, supported the previous policy of tolerating those with privately-held Arian views. Theodosius I must be largely credited for calling the council, determining its leadership, and enforcing its major decrees. At the close of this council Theodosius declared that Arian pastors should be put out of their churches and replaced by those affirming the new trinitarian formula determined at Constantinople. I Constantinople continued the unfortunate trend of imperial leadership in Christian religious affairs and established a unity of church and state which led inevitably toward intolerance and the politicization of religious issues. Although Arianism would soon become a dead issue politically, new doctrinal controversies would soon arise to divide the most powerful bishops, and the empire would again be torn by Christian factions arguing not so much about the Trinity itself as about the question of Christology. Movements such as Nestorianism, Monophysitism, and Monothelitism soon would move to the fore, and the christological controversy would be the topic of the Council of Ephesus of 431 and the Council of Chalcedon of 451. ↑ "The profession of faith of the holy fathers who gathered in Nicaea in Bithynia is not to be abrogated, but it is to remain in force. Every heresy is to be anathematised and in particular that of the Eunomians or Anomoeans, that of the Arians or Eudoxians, that of the Semi-Arians or Pneumatomachi, that of the Sabellians, that of the Marcellians, that of the Photinians and that of the Apollinarians." ↑ "Diocesan bishops are not to intrude in churches beyond their own boundaries nor are they to confuse the churches: but... the bishop of Alexandria is to administer affairs in Egypt only; the bishops of the East are to manage the East alone...; and the bishops of the Asian diocese are to manage only Asian affairs; and those in Pontus only the affairs of Pontus; and those in Thrace only Thracian affairs. Unless invited, bishops are not to go outside their diocese to perform an ordination or any other ecclesiastical business. ...The churches of God among barbarian peoples must be administered in accordance with the custom in force at the time of the fathers." ↑ "Because it is new Rome, the bishop of Constantinople is to enjoy the privileges of honour after the bishop of Rome." ↑ "Regarding Maximus the Cynic and the disorder which surrounded him in Constantinople: he never became, nor is he, a bishop; nor are those ordained by him clerics of any rank whatsoever. Everything that was done both to him and by him is to be held invalid." ↑ "Regarding the Tome of the Westerns: we have also recognized those in Antioch who confess a single Godhead of Father and Son and holy Spirit." ↑ "...The sacred synod of bishops assembled at Constantinople has decided not to admit accusers without prior examination, and not to allow everyone to bring accusations against church administrators—but without excluding everyone... If the charge brought against the bishop is of an ecclesiastical kind, then the characters of those making it should be examined, in the first place to stop heretics bringing charges against orthodox bishops in matters of an ecclesiastical kind... In the second place, persons previously condemned and expelled from the church for whatever reason, or those excommunicated either from the clerical or lay rank, are not to be permitted to accuse a bishop until they have first purged their own crime..."
↑ "Those who embrace orthodoxy and join the number of those who are being saved from the heretics, we receive in the following regular and customary manner: Arians, Macedonians, Sabbatians, Novatians, those who call themselves Cathars and Aristae, Quartodeciman or Tetradites, Apollinarians—these we receive when they hand in statements and anathematize every heresy which is not of the same mind as the holy, catholic and apostolic church of God... But Eunomians... Phrygians [Montanists], Sabellians... and all other sects... we receive all who wish to leave them and embrace orthodoxy as we do Greeks [non-Christians]. On the first day we make Christians of them, on the second catechumens, on the third we exorcise them by breathing three times into their faces and their ears, and thus we catechize them and make them spend time in the church and listen to the scriptures; and then we baptize them. History of "First Council of Constantinople"
This page was last modified on 11 April 2017, at 23:00.